This page of our notebook will describe our process of making bar soap. 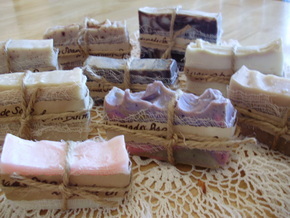 All of our recipes are "cold processed" soaps. Because of the nature of working with raw ingredients, utmost caution is advised, especially when handling lye (sodium hydroxide). I have unfortunately been burned quite a few times because of my lack of said caution. So from personal experience, I warn you to be careful. Always wear protective gloves, long sleeves, something on your feet, (in case it spills), and perhaps eye protection. Be careful not to inhale the fumes of the water and lye mixture- or you'll be coughing for a bit. Just use common sense and be aware of your surroundings. Follow these photos for a step-by-step process. These steps easily apply for any type of cold-process soap, and can be customized to meet whatever your personal tastes might be. Be careful, and if you have any trouble at'all, please gimme a shout out on our howdy page. due to excema and psoriasis, cure scars and remove stretch marks. Natural, unrefined cocoa butter. Mmmm! 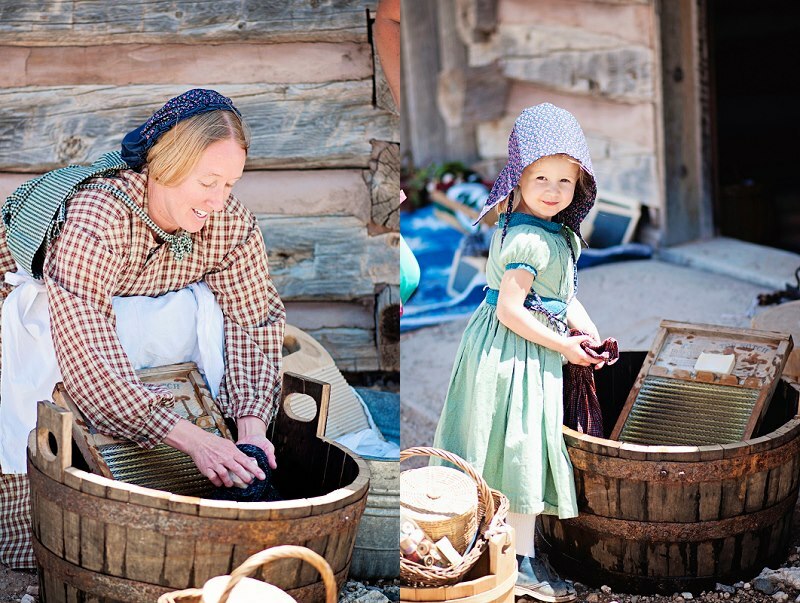 Soaps can be just plain old-fashioned, like our Pioneer and Castile soap, and used for Living History encampments and demonstrations. Great for camping, too, since our soaps are made with biodegradable natural oils and animal fats that are safe for run-off. 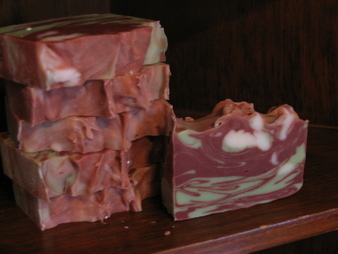 Other soap bars are simply fun to make, like the Cocoa Mint. I mean, who can resist chocolate? 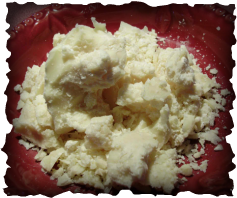 The cocoa butter is best when unrefined, so it retains it's natural chocolate-y aroma and creamy color. Some soap-makers prefer the refined stuff that is odorless and bleached white, but who wants that? I have used different fragrances with it, and it smells just fine, I am pleased to report. Enough said . . . let's make soap! Gloves & apron- protect your skin! 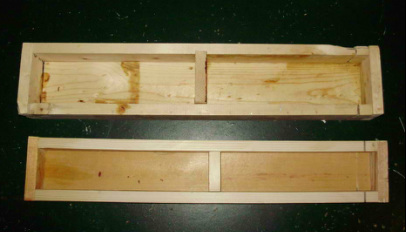 Soap mold. If wooden, lined with freezer paper. If plastic, greased well with veggie oil or Vaseline. Dating back to the early 19th century, our Pioneer Soap is made with tallow (natural beef or deer fat). Unscented and a natural creamy white, this very hard and long-lasting bar soap produces a rich, creamy lather even in cold water. It's great for hunters who don't want their human scent in the woods, or for folks who prefer a non-fragrant soap. Also great for hand milling, since you can then add your favorite essential oils, herbs/ spices, and colorants. I. Using an accurate scale, carefully measure the ingredients. Pour water into bucket. Slowly add lye. Face away so you don't breathe the fumes, and stir to dissolve completely. This step is crucial, since if not dissolved properly, it will ruin the entire batch of soap. It should be a cloudy white liquid with lots of steam. Oh- make sure the surface you are working on is heat-proof. The chemical reaction between lye and water gets hot fast and takes awhile to cool. Keep stirring, and with the other hand, pour in the tallow. This is where it's nice to have a friend helping. Continue stirring with the spoon, or use the stick blender to mix thoroughly, being extremely cautious not to splash it. The soap at trace... when it reaches the consistency of sour cream and the trail is left behind when you pull the stick blender out. Water with the lye crystals completely dissolved. Notice the cloudy white of the water. I used the stick blender TURNED OFF to stir only. II. 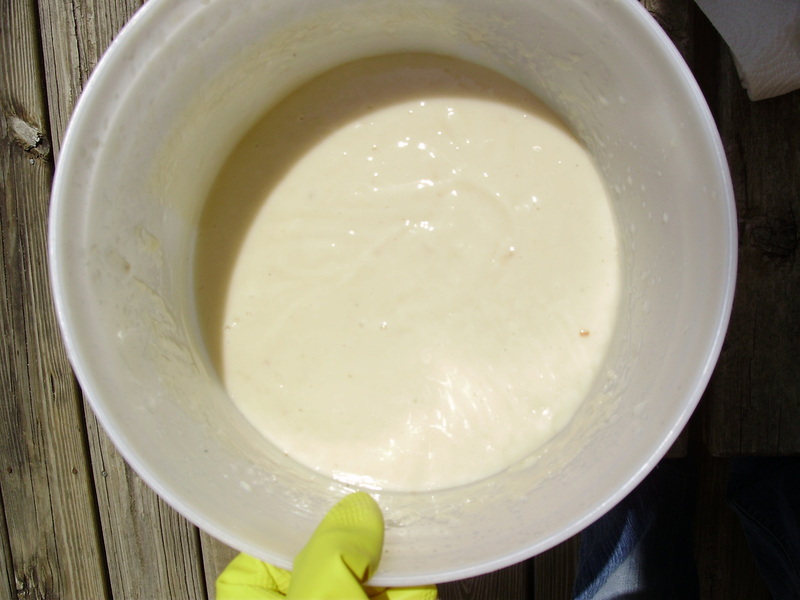 When it comes to trace, that is, when it reaches the consistency of yogurt or sour cream, immediately pour into mold. Use a rubber spatula to get it all out. 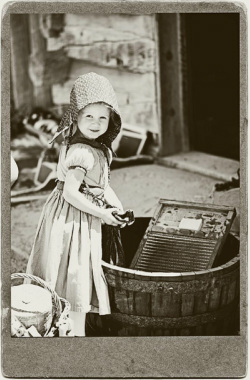 Set the bucket and utensils aside to wash out later, usually about a day so that you don't get a rash on your hands and arms. Been there, done that. Or leave your gloves on and rinse with hot water immediately. That way you can make another batch right away if you wish. The soap has been poured and is now ready to cure overnight. III. When it comes to trace, that is, when it reaches the consistency of yogurt or sour cream, immediately pour into mold. Use a rubber spatula to get it all out. Set the bucket and utensils aside to wash out later, usually about a day so that you don't get a rash on your hands and arms. Been there, done that. Or leave your gloves on and rinse with hot water immediately. That way you can make another batch right away if you wish. Pour it quickly but carefully so it doesn't set up in the bucket. We might as well make it enjoyable. IV. Allow the soap to cure overnight (or 24 hours) and slice into bars. (About 3/4 inch thick is good.) Set them apart on a shelf lined with newspaper to cure undisturbed for 2-4 weeks and voila! You have just made your very own homemade soap. Now knock yourself out and do some laundry!! This is our base recipe that we use for most of our soaps. 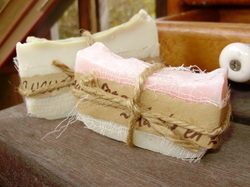 You can customize this soap with essential/ fragrance oils, colorants, and exfoliants. Yields: 4 lbs. I. Measure water into bucket and slowly add lye. Stir to dissolve. II. Add tallow and oils. Stick blend to slight trace. III. Add essential/ fragrance oil. Stick blend thoroughly. FYI: Some essential oils can speed trace. Just watch and you might need to move quick at this point to pour into your mold in time. IV. Add oxide or mica and blend completely. V. Pour into prepared mold. Use a spatula to get it all out. Don't waste any! Allow to cure overnight. VI. The next day, remove hard soap from mold and peel off freezer paper. Slice into bars. Cure on newspaper lined shelf for 2-4 weeks for best results. Now give yourself a pat on the back. Good job! 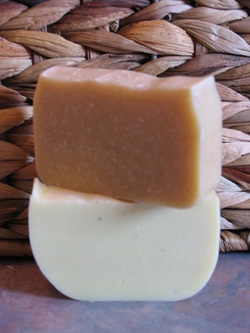 Castile soap has been used for hundreds of years. Named for the Kingdom of Castile in Northern Spain, this very hard bar was once used historically for carving intricate designs. Yield: 4 lbs. I. Measure water into bucket. Slowly add lye, stirring to dissolve completely. II. Add olive oil and tallow. Stick blend to trace. III. Pour into prepared mold. Use a spatula. That's all there is to it! Super easy, huh? You're catching on now. This one takes a little more thought. But I think after you've gone through the last few recipes, you are ready to tackle this favorite soap. We'll be using the Base Recipe and customizing it. Warning: your kitchen will smell like an Andes Mint. I. Measure water into bucket. Slowly add lye, stir to dissolve. II. Add tallow and oils. Stick blend to trace. III. Add peppermint essential oil and cocoa butter. Stick blend thoroughly. IV. 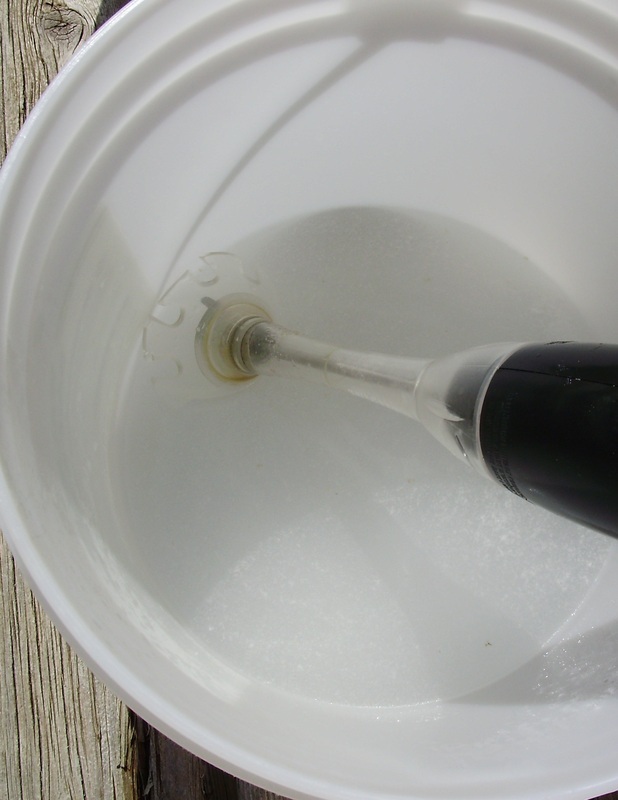 Pour half the soap into one of your oil measuring containers. To the soap in the bucket: Add cocoa powder. Stick blend thoroughly to a nice chocolate brown. To the soap in the oil bowl: Add green colorant. Stick blend carefully to a nice mint green. V. Here is where is gets a LITTLE TRICKY. Slowly pour the green soap into the bucket with the rest of the batch. Pour it into ONE spot, not all over. Then grab your spatula and make ONE pass through. VI. Pour the soap into your prepared mold. See the colors coming in layers? Allow to cure as before and when you slice it the next day, you should see a pleasant swirling effect. See photo. Note: Each bar will be different. 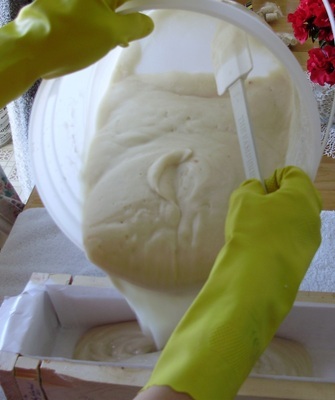 That's only natural when you create handmade bar soap. Good work, chica!